This certainly has been a spectacular autumn. There have been so many options for viewing the changing season and a quick walk to Moose Pond is one of our favorites. Even as the season wanes, there seems to be plenty of color in the mountains. 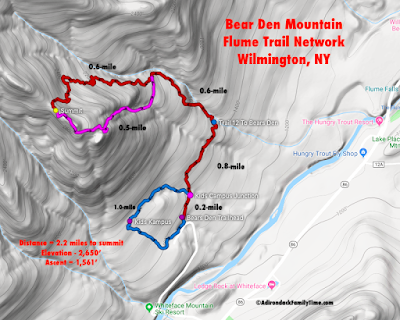 This easy Adirondack family hike begins between two fields on Rt. 3 between Saranac Lake and Bloomingdale. Since it is midweek and no other cars are around, I park at the canoe carry at the Saranac River bridge. There is parking for three cars by the bridge, but during busy weekends and summer days it’s best to park at the pullover on Rt. 3 and walk the additional 300 yards. According to Historic Saranac Lake the Rt. 3 trail to Moose Pond was once a logging trail and then became the access for a private club called “Bel-Lago Park” in the 1920s. It has since converted back to state land. It has long since overgrown and narrowed to become the current foot access only trail. The trail to Moose Pond is generally flat with a few rolling hills. I have a visitor who isn’t able to walk the trail due to a minor injury, but wants to be taken somewhere to draw. I need to walk the dog so a trip to Moose Pond is perfect. I park the car and help my friend settle on the shore of the Saranac River. My puppy and I continue over the bridge, sign the register, and continue along the unmarked trail. I reach the first junction in 1.2-miles and decide to walk the loop trail to see more of the autumn colors. I bear left at the first junction and reach the second junction in about 0.25 miles. Moose Pond can be see through the trees. 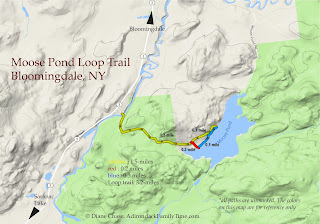 The trail to the left heads north and will follow the western shore, passing various campsites, ending at the Moose Pond boat launch on Moose Pond Rd. 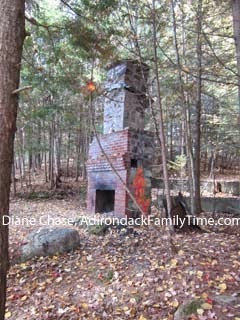 The trail to the right will loop back to the main trail, passing an old chimney and the remains of a house foundation. 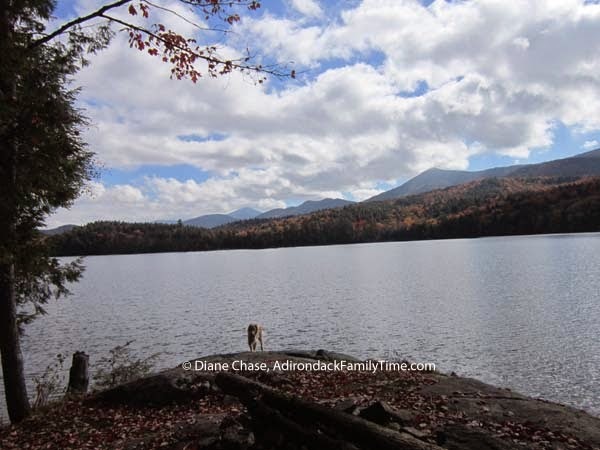 The dog is already in the water so I stop for a bit and enjoy the view of Whiteface Mt from the open rocks that lead to Moose Pond. I continue along the shoreline and in 0.25-miles reach a second group of rock boulders that overlook the lake. The trail then heads west connecting with the main trail in an addition 0.3-mile. It is an easy return to the bridge. My friend is still the only one there and has produced some beautiful sketches while I had a wonderful 3.5-mile roundtrip walk. 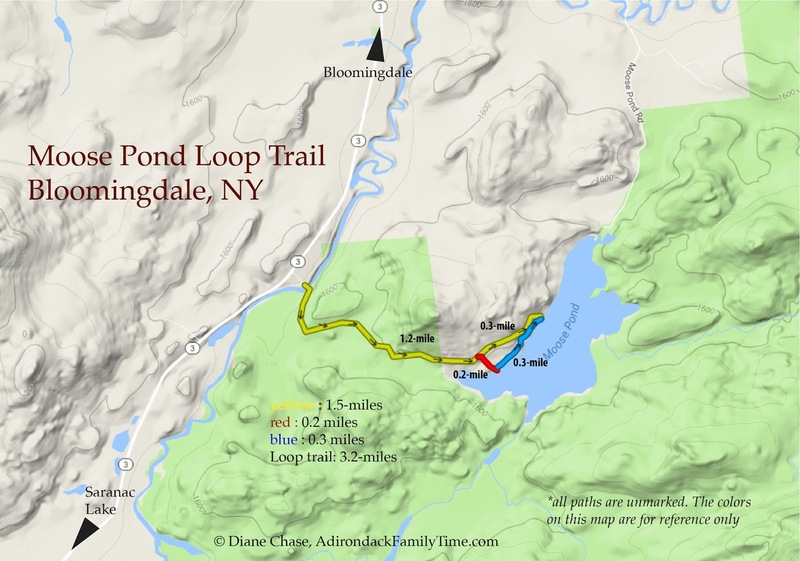 To access the Moose Pond trail from Saranac Lake drive four miles north on the Bloomingdale Rd. or from the Bloomingdale four corners drive 2.5 miles south of Rt. 3 (past the school bus garage). The roadside pullover and unmarked entrance is on the east side of the road. 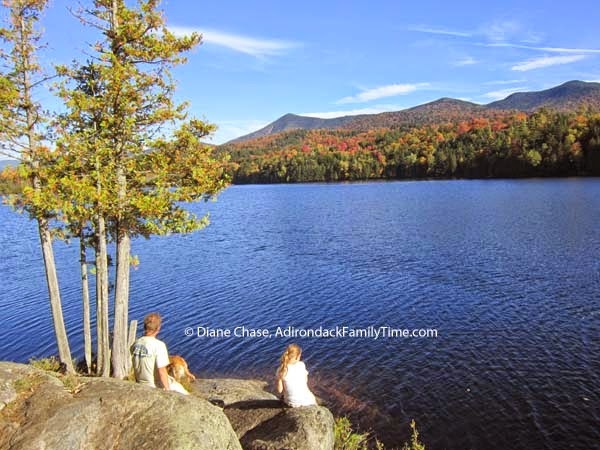 © Diane Chase is the author of the Adirondack Family Activities™ guidebook series, Adirondack Family Time™Tri-Lakes and High Peaks has over 33 easy hikes for the Lake Placid, Saranac Lake and High Peaks area, which is available online or bookstores/museums/sporting good stores. 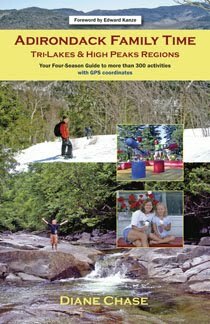 Diane is currently working on the next guidebook in the four-book series of Adirondack Family Activities™.